HighLow Avaliação - Análise do Brasil! 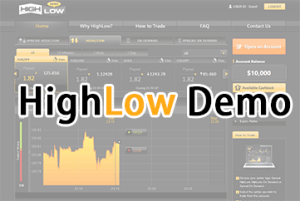 HighLow is an Australian broker established in 2013 on Market Pulse platform and is only regulated by ASIC. As opposed to other brokers, HighLow resides in Sydney where it is also regulated. Minimum deposit is set to only $50 together with $50 CASHBACK offer which basically means riskless trades. HighLow uses their own platform which is not much known about yet. The platform is called Market Pulse and is very fast, responsive and their options expire always on time which is one of the main strengths of this broker. Trades as low as $ 10 are possible. Overall, their platform has a fresh feel to it and nice looks. Disadvantages of their platform are few financial instruments available to trade (22) and inability to position the graph. However, this can be done with other programs as well (for example MetaTrader, more on MetaTrader in our highly recommended tutorial: MetaTrader tutorial). A great advantage is that Broker HighLow offers free unlimited demo account after registration. Therefore, you don’t have to deposit funds as is the case with other brokers and demo account is available right away. Register now and get your free demo account! In case you are not satisfied with HighLow demo account, you can try free demo account at our page xBinOp (binary options demo). No registration needed, therefore, you can start trading immediately. Both experienced and novice traders will appreciate $50 cashback bonus which is more like risk-free trades. In practice it means that if the total trade volume does not exceed $50 then all your trades will be either successful or broker will return your invested funds with no strings attached. You don’t need to make more trades (wagering requirements) and you can withdraw your money anytime. 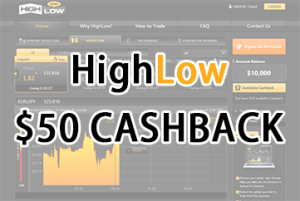 The only condition for the HighLow bonus is that you make a minimum deposit of $50. So what are you waiting for? This broker does not only offer high-low binary options., but also spread binary options. 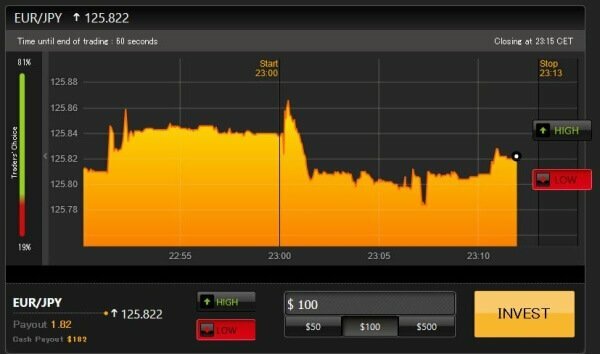 This type of binary options is characterized by having 200 % profit instead of usual 70 or 85%. The profit in not dependent on selected expiration date. The only disadvantage of this type of options are that price has to cross a boundary of few (usually around 6) pips in the selected option direction (call or put) in order to be profitable for us. Among other factors that position HighLow at the top are Android and iPhone mobile applications which you can conveniently use to trade regardless of your whereabouts. Fortunately, their mobile application is as fast as the web platform. Try it for yourself! HighLow offers many different ways to deposit funds into and out of your account. These include Visa, Mastercard, Wire Transfer, Amex, and Neteller. Deposits are usually done immediately, but withdrawals could take 1 day. Minimum deposit is a low $50 when you use a credit card or Neteller, but if you use a bank wire transfer you can deposit as low as $10. Minimum withdrawal is $50 and can be instant with a fee, or takes around 1 day without a fee.